SayWhatNews: Good morning Symana. Thanks for speaking with SayWhatNews. First tell us who is Symana She Speaks? Symana: Thank you for allowing me to speak with SayWhatNews, It is an honor indeed. Well I am a writer, an author, a concerned citizen, a poet, a mother, sister, daughter, and friend. I am a person that wakes up and realizes that the world could be fine without me or if I choose it could be great with and prayerfully because of me. I am Symana and to me that means trying to find my purpose and then live up to it in my own unique way, daily. SayWhatNews: Symana, you started writing poetry at a young age. What inspired your love for poetry? Symana: It was actually my only option. I was a lost child and writing found me. It saved me, literally. There were so many times that had it not been for my paper and pen, I would have self-imploded. My life was one of silence; I never spoke about my feelings, my hurts, my concerns, and my joys… out of fear or whatever. But I did write. And in doing so I found my voice. SayWhatNews: There are a few black poets who have become household names like Maya Angelou, Nikki Giovanni and Langston Hughes. Which poet/s influenced you growing up? Symana: Actually I didn’t even know that what I was writing had a name. So when I was very young I didn’t realize that there were people out there doing this poetry thing for centuries. But as I became aware those very people you just named became my inspirations. Although I must admit that I never read any of their completed works. I always had this fear that if I did so; I would pick up their voice and lose my own. I have always hoped to be authentically me, although at times I am not always sure who exactly that is. So I must say all the greats inspire me (if not via any particular piece of work) certainly their journeys. SayWhatNews: In May of 2010, you entered the Spoken Word scene. What inspired you to become a Spoken Word artist? Symana: For the second time in my life poetry saved my life. I was plagued by migraines to the point I was seeing doctor after doctor and I remember thinking my days were numbered, I hadn’t picked up a poetry pen in years. And I prayed that God would allow me to return to my first love (poetry) before I checked out. And He was gracious enough to do just that! I never set out to become an artist (well known or otherwise) I just wanted to write again. Oh but God! SayWhatNews: For those unfamiliar with the Spoken Word art form can you explain what it is? SayWhatNews: “Symana She Speaks…Love” is the name of your first book. What inspired you to write a collection of poems about love? SayWhatNews: What is the message in your book “Symana She Speaks…Love” that you want your readers to grasp? Symana: When reading my book I would hope that the reader finds strength in knowing they are not alone. That someone other than them understands heartbreak, failure, fear of success, etc. I would love for the book to allow those who can’t relate to my struggles (because I know that not all people will or do) to at least respect my climb. At our core LOVE is all we really need even if we don’t acknowledge it. I hope that my book will give wings to just one person that’s afraid to fly, afraid to cry, afraid to love. 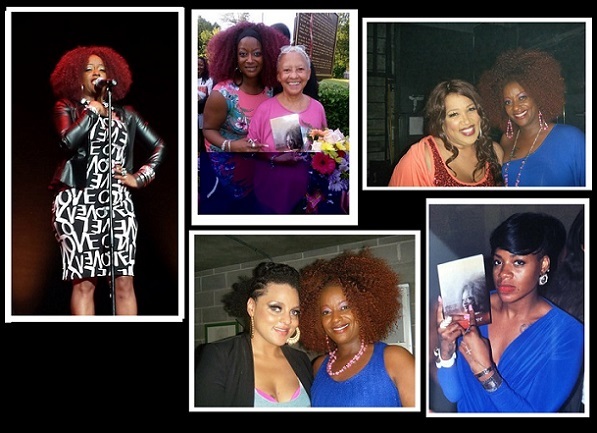 SayWhatNews: Symana, I see you also released your debut CD, “Finally….She Speaks”. What can fans expect from this body of work? SayWhatNews: The majority of artists find inspiration from their own lives or things that they have witnessed first-hand when writing a new song, a book or movie. Where do you get your inspiration from when writing a poem? For example, “Salle Mae” what inspired this Spoken Word piece? Symana: I agree that inspiration, for the most part is personal. And the Sallie Mae piece is certainly a great example. The back drop to that story is, that for over a decade (before returning to poetry) I was saturated in the word of God I only listened to gospel music. I was a church secretary, in the choir (although I can’t hold a note). I taught Sunday school and ministered the Word regularly. I hadn’t uttered a curse word in like 20 years! So when Sallie Mae came to me I was mortified by the language, so I kept rebuking it! I refused to write it down but night after night it would return to me for 2 weeks straight. Finally, I gave in and conceded to the heavens that I would just write it down so it could leave me alone. But I swore I’d never read it aloud. Well one day I’m at an open mic and the nudge returned. Everything in me said read it, Symana! And so I did and the rest is history! Sallie Mae has become one of my most requested pieces, I literally get asked to spit it every time I step on stage. So the lesson for me is, it is one thing to ask to be free. And it is a completely other thing to walk in that freedom. A curse word doesn’t mean I’ve lost my way. That God no longer finds glory in my story. I don’t know why He chose to give that piece to me. But I do know all that I write is conceived by Him and I have made the wise decision to not question the conception, but to simply deliver! Inspirations come from grass, people holding hands, a baby looking in the eyes of its father, and yes that tyrant Sallie Mae. It’s not my job to seek inspiration as much as it is to except when and how it comes. SayWhatNews: What is your writing routine when you are working on a new poem? For example--Do you need to be in a quiet room or sitting on a bench in the park with the back drop being the Ohio River and etc? Symana: I honestly don’t have a writing routine. But I do think I need one. I can’t conjure up writing I have to be inspired. So I find myself texting myself thoughts as they come. I grab a napkin at a restaurant and pour out line after line. When it hits me I just try to stop what I’m doing and give it my undivided attention. My goal is to one day set aside ‘writing time’ but for now I just try to be obedient to that pull when and where ever it grabs me. 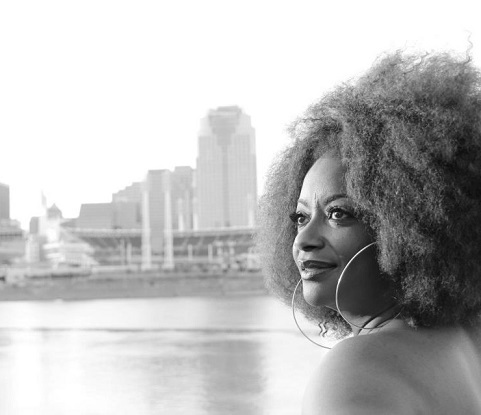 SayWhatNews: Symana you have become one of Cincinnati’s well known Spoken Word artist. How amazing is it for you to see your work enjoyed and loved by many? Symana: Well I must say it is completely humbling to find myself in this position. I love those who wrong me, I pray for those that misunderstand me, I am aware of those who don’t care for me. But more than anything I am blessed to be able to love those that genuinely love me or at least love my work. Being accepted at this stage in my life is liberating to say the least. I have never been the coolest, the pretiest, the smartest, but their love has shown me that I never needed to be any of those things. Being me for them, for me, for God, is enough! And that knowledge humbles me beyond words. 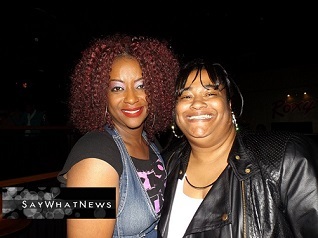 SayWhatNews: You have shared the stage with some amazing artist like Fantasia, Marsha Ambrosius, Erykah Badu, Johnny Gill, Nikki Giovanni, Kym Whitley and many more. That experience alone must blow your mind. Has there been one moment that sticks out of your mind from the rest where maybe a famous artist gave you advice or said something to you that just resonated with you? Symana: Yes indeed sharing space with those people was as amazing as they are. What sticks out for me and what I recall often are the words I received regarding my performance jitters. I mean when I leave the stage rather it is a neighborhood open mic or an arena with thousands of people. My knee, hands, my being, literally shakes uncontrollably. Well any who both Erykah Badu and Marsha Ambrosius noticed and independently gave me the same advice. Basically they told me that those nerves will keep me honest, that the jitters are proof that I want to please those that listen to my words, and that if I ever lose that feeling, it’s time to sit down. What I took from that was the realization that the moment I become complacent, the moment I start to thinking I’m all that… in that moment I will become of little use to the world! Deep, right? I live by those words to this day and I hope I always will. SayWhatNews: Yes, very deep and something to think about. Now, I have to ask, what was it like sharing a stage with the iconic Nikki Giovanni? SayWhatNews: Besides writing poems and being a Spoken Word artist, you are also a Motivational Speaker. How can someone get in contact with you for an event? My website will be up within a few weeks and I’ll share the link on all the above outlets. SayWhatNews: What’s next in the future for Symana She Speaks? Symana: What’s next? Great question… I hope to keep allowing God to use me. I pray for the strength and wisdom to hear His voice and to walk through each door He opens. I look forward to the future although I have no idea where I will land. I wish God would tell me what my ends gonna be. But He is wise enough to know that If He did so I’d probably run in fear. So if my end will include any or all of those things; you may find me rich or poor, married or single, young or extremely old, but you’ll find me happy, blessed, and aware, that sometimes the greatest blessing aren’t in the destination but in the ride! And I plan to ride this life until the wheels fall off. 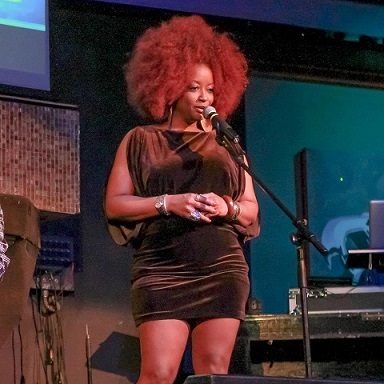 Since this interview with SayWhatNews, Symana She Speaks has left her home in Cincinnati and embarked on a new venture down south in Atlanta, Georgia to bigger and better things with her career. The Family at SayWhatNews wish her many blessings as her well deserved star shines brighter with success.